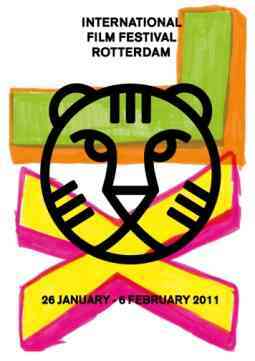 The 40th edition of International Film Festival Rotterdam (IFFR) begins from 26 January to 6 February 2011. The first or second feature films concurring for three equal top prizes of each 15,000 euro, includes three world premieres. Two of the competing films have been supported by Rotterdam’s Hubert Bals Fund. 	Lee Ranaldo, vocalist, guitarist, composer and co-founder of noise rock band Sonic Youth (USA). The Jury of the Tiger Awards selected the following 14 films for the prestigious Tiger Aawrds and the winner will be announced on Friday February 4, 2011. A tale about a computer teacher, a black magician and a cyber creature who are predestined for online and offline encounters. The story oscillates between Indian mythology, surrealist personal symbolism and the cyber world. First feature film of Vipin Vijay. A moving and visual portrayal of the excitement, alienation, and loneliness nineteen-year old Alicia experiences when she leaves her parental home in Mexico for Buenos Aires with the ambition to become an acrobat. First feature film of Elisa Miller. Yoon’s New Current Award winning film focuses on the subdued aggression and explosive relationships among friends in Korea’s often repressive school system. First feature film of Yoon Sung-Hyun. Portraying two lost ghosts who take the Way of Saint James to the end of the world (Finisterra), this hypnotizing road movie is a treat for eyes and ears. It draws inspiration from Philippe Garrel’s The Inner Scar. First feature film of Sergio Caballero. Argyris Papadimitropoulos and first feature film of Jan Vogel. Funny, serious and touching at the same time, the film offers a view of contemporary Russia following three parallel stories of old school friends. Now a police officer, taxi driver and surgeon in their forties, they cross paths without realizing it. Second feature film of Vladimir Kott. This intimate Iranian film tells the story of an urban teenage boy trapped between his parents’ divorce and his own troubles. It reveals a seldom shown side of Iranian society – middle class urban youths that have the same problems as everywhere around the world. First feature film of Majid Barzegar. Subtle distance characterizes the point of view of the filmmaker towards his subject: a female photographer makes her way through 21st century Berlin, a city full of artistic and complicated people. Second feature film of Lawrence Tooley. Blurring borders between documentary and fiction, this film portrays a few moments from the lives of three men from Belo Horizonte: a transsexual prostitute and academic, a Hare Krishna soccer fan and a would-be writer. Winner of five awards at the Festival of Brazilian Cinema. First feature film of Sérgio Borges. In Love Addicton, superior improvisation and total commitment overcome all limitations of low budget film-making. The filmmaker points his camera at four characters, co-workers who have complicated relationships during and after working hours. Second feature film of Uchida Nobuteru. This daring, exciting story from northern Sri Lanka convincingly captures the madness in a land where the psychology of war is omnipresent. Three parallel stories deal with the attempts of ordinary village people to lead a normal life in abnormal circumstances. First feature film of Sanjeewa Pushpakumara. After his death, a man returns to the landscape of his childhood and relives the relationship that was meant to last forever. Eternity is a romantic and spiritual film as well as a meditation about the death of a loved one. First feature film of Sivaroj Kongsakul. One Sunday morning, a Colombian farmer finds a pile of dead bodies in his corn field. On Election Day, the local politicians however have other things on their mind than dealing with the crime. Second feature film of Carlos Moreno. Already an award winning film, The Journals of Musan portrays the plights and emotions of a North Korean defector who is trying to adapt to South Korea’s capitalist society. First feature film of Park Jung-Bum, who plays the lead himself.